In 2006 I wrote a book called Information Trapping. It was about monitoring the Internet for useful knowledge without spending 24 hours a day glued to a screen. The book covered RSS feeds, web sites, and other features of the Internet at that time. It was a little before what is now known as social media, and did not cover sites like Twitter, Pinterest, or the insidious Facebook. That's right; I said insidious. Because if you try to use Facebook to monitor your favorite topics, companies, and institutions, you're not going to get what you asked for. Facebook Fan Pages and Organic Reach Facebook Fan Pages (or "Brand Pages") are pages devoted to companies, entities, public figures, causes, and so on. Instead of friending these pages, you "Like" them. When you like them, you receive updates from those fan pages in your Facebook feed. At least, that's the theory. In reality Facebook puts a limit on how many people a given Page post will reach. In fact, a recent article in Ad Age noted that the average Page post on Facebook reaches less than 7% of its fans. That's right; out of every 100 Page fans, less than 7, on average, would see a post from that Page. I have discovered this myself with my ResearchBuzz Page on Facebook. 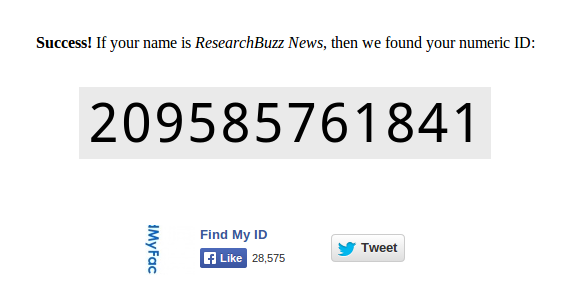 ResearchBuzz has 3,142 fans on Facebook at this writing, yet a recent post reached only 52 people. This is irritating enough for the average Page owner, but it's just as bad for a Page follower! If you're using Facebook to try to gather information and monitor topics of interest to you, you don't want to be at the mercy of Facebook as it decides which posts you get to see. So what's the big deal? Why not just ignore Facebook and use other social media and web tools to keep track of the topics which interest you? Unfortunately it's not that simple. Many companies, institutions, and brands use Facebook as a substitute for a blog, which means if you want updates on what they're doing, you have to read their Pages. I suspect that if Facebook keeps cutting off the organic reach of its Pages, we may see more companies and institutions going back to blogs and web site updates, but for now Facebook is vital for topic monitoring. And when it comes to monitoring Facebook, you have three options. Option one is to just go with what you get from Facebook. Assume that you're going to get a fraction of the posts from a Page, and regularly visit Pages of interest so you can review all posts directly instead of waiting for them to come to your Facebook timeline. This works all right if you're following only a few (less than ten) Pages on Facebook. Otherwise it is time-consuming. I currently have 326 Pages "Liked" on Facebook. Even if I spent just thirty seconds once a week going to each one directly and looking at its posts, that would be over two and a half hours a week. Furthermore, thirty seconds is a very optimistic estimate. In addition to "Like"ing a page, you have the option to create "interest lists." 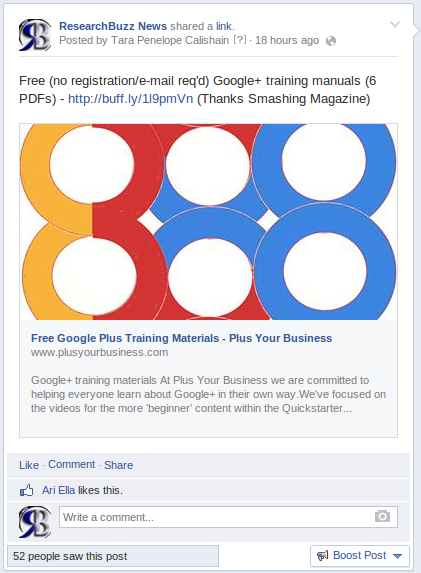 Both Facebook Pages and individuals on Facebook can be gathered into an interest list and reviewed in one spot. Facebook has an overview of interest lists and how to create them, but let me give you one example. I have an interest list called Bad Weather North Carolina. 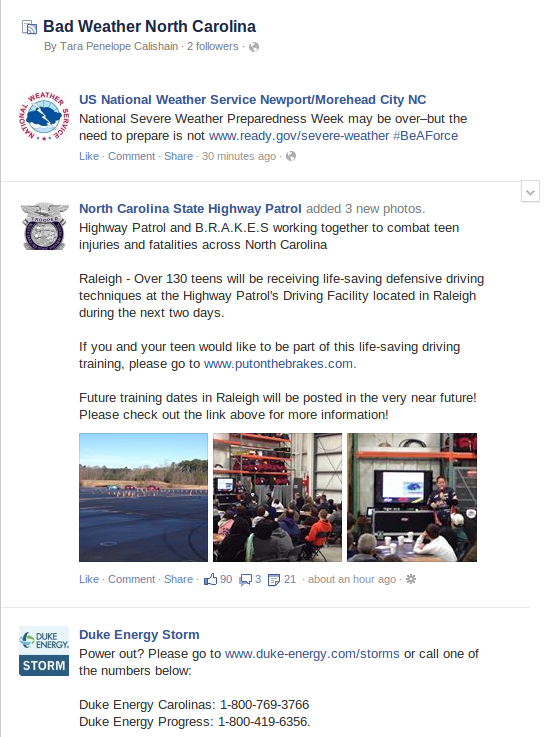 This is a group of Pages that provides forecasts, emergency updates, and other useful weather information. When bad weather threatens I regularly browse this interest list. That works fine when I need to monitor things because of a very specific situation, but it's more awkward to review regularly. Still, if you have a medium number of Facebook Pages "liked," say between 20 to 50, an interest list might be the best way for you to review those Pages with a minimum amount of work. If you have a large number of Facebook Pages "liked," however, and you regularly pull information from these pages and use it elsewhere, I feel like you can't beat Option 3: RSS feeds. RSS feeds! They were a big deal back in the early 2000s but have fallen out of favor as social media has become more prominent. RSS stands for Rich Site Summary; some people say Really Simple Syndication. It's an easy way to get a summary of the changes or additions to a web page. Furthermore, you can get those changes without having to visit each page directly – or in this case, every Facebook Page directly. Facebook does not have a simple tool for extracting and using these RSS feeds, so that's what this article is about: extracting the RSS feeds from your "Like"d pages, creating an OPML file (more about them later), and getting the feeds into an RSS reader. Facebook RSS feeds come in two parts: the base URL and the page specifier. I would just get the Facebook home page. To easily find the Page ID number for a single page, go to http://findmyfacebookid.com/. Enter the URL of a Page, and it'll return you a long number. Copy and paste that number onto the end of the base URL, and you have an RSS feed! This URL won't work in some browsers. It's designed for RSS feed readers, which we'll get into a little later. Right now I can just hear you: "Good grief, Tara, you're asking me to manually copy and paste the URL of every page I'm a fan of into this tool, and then copy and paste the number onto the end of a URL to make an RSS feed? Don't you realize I have things to do? That'll take forever!" You're absolutely right – it will take forever. But you can do it a lot faster. Here's how. The first step is simply to go through your Facebook Likes (you can get to them by going to your Facebook profile page and choosing "Likes" from the left column) and discard the topics you're not interested in anymore.